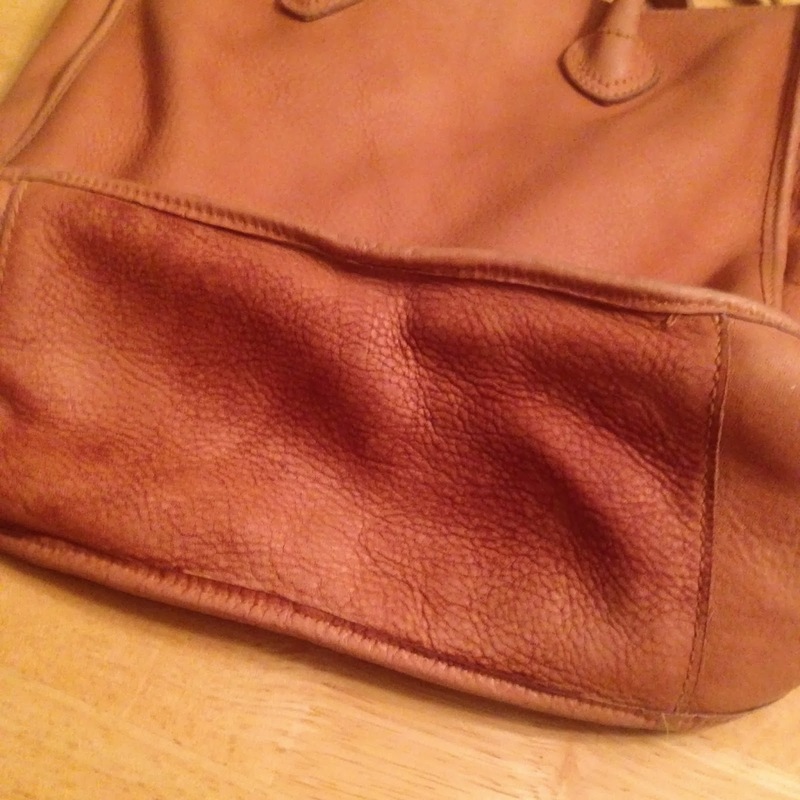 So I took the bag to a professional leather cleaner and paid a decent penny to have the stains removed. 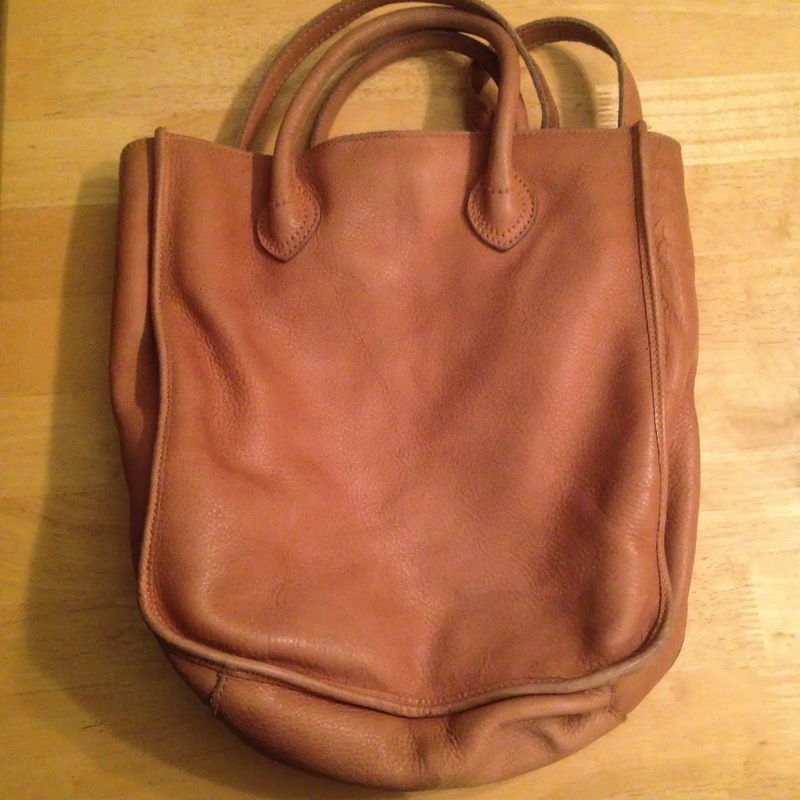 When I got the bag back, the stains were gone, but the bag no longer had its buttery soft leather texture. The bag was stiff, and I was super sad again. I called Madewell, hoping that they could tell me how to care for the bag. They kept me on hold for a while, then told me to go to a professional leather cleaner. Sigh. That's how I ended up calling in the first place! After a bunch of Google searches, I reached out to the folks at Chamberlain's Leather Milk and sent them a link to the bag I'd purchased. 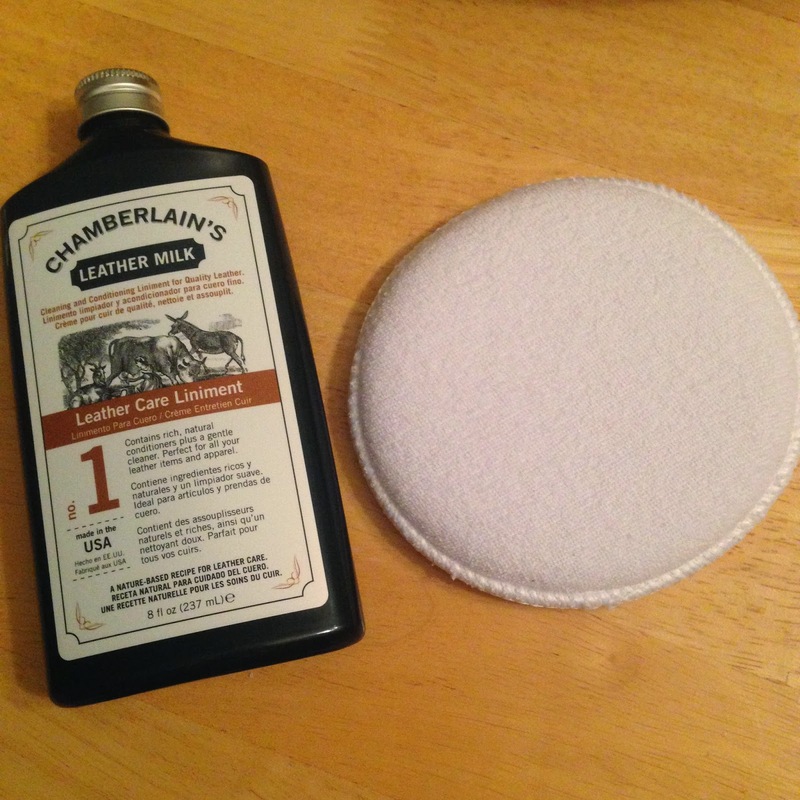 Within a couple of days, a rep from Chamberlain's told me to try their Leather Care Liniment. 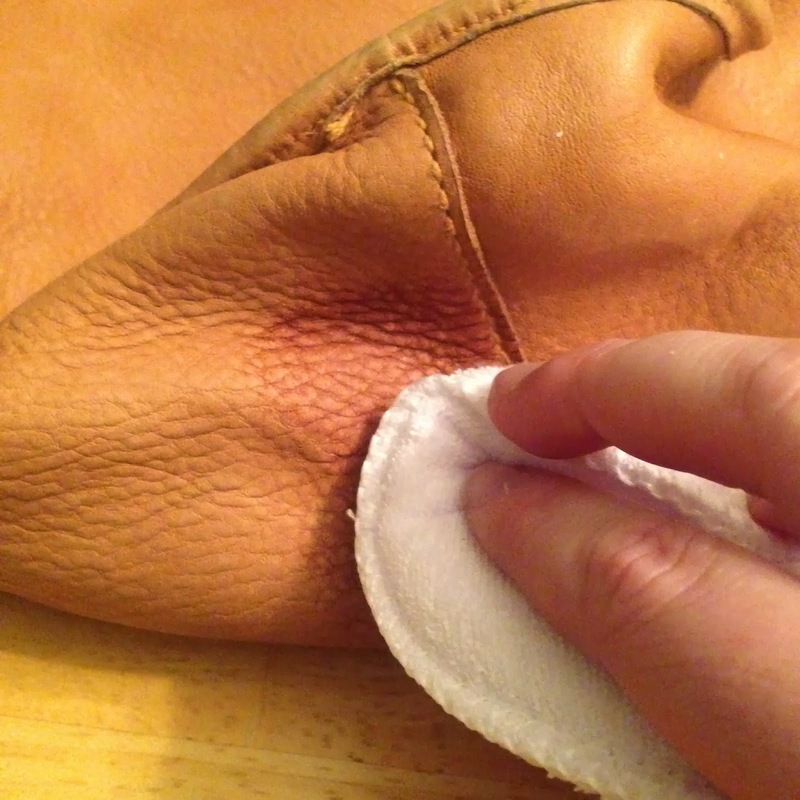 I applied the liniment as directed, but tested a small spot on the bottom of the bag first. I knew that adding anything to the bag might affect the colors, but I also didn't want to wait years for the bag to regain its softness from natural oils/wear. I took the plunge and treated the whole bag. This last photo is of the bottom *before it dried* so you can see how it brings out the leather grain a little bit more. I am very pleased with how the liniment has revived the bag, giving it a softer feel again. The color does not appear to be changed to me; in fact, it still looks just like the first photo in this post, only more soft and supple. So I would say it was a win! I definitely think I will make a habit of treating this bag so it doesn't get stiff again. It looks like buttah now! Good choice and thanks for the recommendation! I've actually never treated one of my leather bags before - I guess you're supposed to "pretreat" them before using? Don't know, but I guess I should look into it. Chamberlain sounds like a good place to start. Caroline recommended some good waterproofing stuff that I sort of pretreated with. If you have different types of leather bags, I'd definitely send some links/photos to Chamberlain to get their reco. I didn't know what to pick out based on my bag's leather type! Thanks so much for writing this post! I finally took the plunge and bought the Madewell Transport tote. It's sitting in my office--unused--because I'm not sure how to treat it. I read Madewell's blogpost about how to treat it, but those specific products weren't available from the site. I've got Chamberlain's Leather Milk (formulas 1, 2 and 3) in my Amazon cart right now but haven't taken the plunge because I'm nervous they won't work to protect my bag. Did you do anything to treat your tote before you used it the first time? Any tips are greatly appreciated! I have a Transport Tote now (the tote in this post my sister now has) but I would suggest you e-mail Chamberlain's directly for a recommendation. You can even send them the link to the Transport Tote and have them take a look! They seriously are a great company and will let you know their thoughts based on the Madewell description. I did not do anything to treat my tote beforehand, but as I mentioned above, I tested the product on a small spot on the bottom of the bag (where no one would notice) just in case! I'll do that! Thanks for responding so quickly!